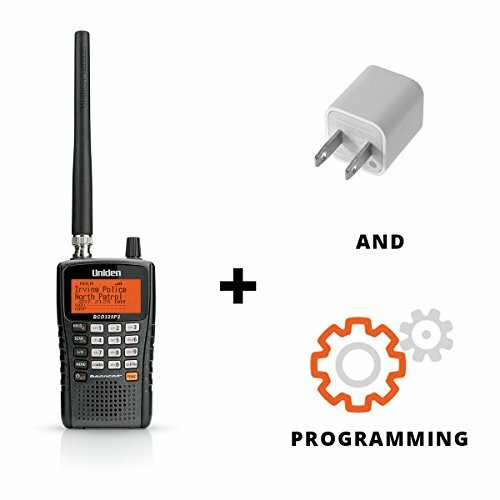 The Uniden BCD325P2 Digital Police Scanner Radio has it all. This handheld scanner comes equipped with features like Advanced Dynamic Memory System, Close Call RFTM Capture Technology, location based scanning, and more. The bundle's included AC power adapter will allow your unit to charge via standard 110v electrical outlet when used with the scanner's provided USB cable. The county programming service will include all public safety channels for your local area making your scanning experience truly local and ready to go as soon as you open the box. Scan and search 25,000 channels on the BCD325P2. With Close Call RF capture technology, this scanner will automatically tune to the signals nearest you, so you can keep track of what's going on in your area. Scanner Includes: BCD325P2, USB data transfer/charging cable, BNC rubber duck antenna, belt clip, wrist strap, and (2) rechargeable Ni-Cad batteries.